From streamlined Aerocycles and classic Phantoms to Varsity eight-speeds and Sting Ray Krates, vintage Schwinn bicycles are popular with collectors. In addition to the fond memories called up by these beautiful bicycles, enthusiasts praise their quality workmanship and enduring value. Whether you're considering a vintage Schwinn for personal use or want to invest in a piece of American popular history, you'll have a lot of options. For more than a century, the name Schwinn has represented a leader in the bicycle industry. The company began in 1895 when partners Ignaz Schwinn and Adolph Arnold founded their corporation Arnold, Schwinn & Company. Eventually, the market for adult bicycles grew smaller as cars became more affordable. Arnold sold his share of the company to Schwinn who realized the importance of manufacturing and marketing bicycles for children. With lower prices possible due to advances in manufacturing, the market for children's bicycles began to grow. If you're interesting in purchasing an antique or vintage bicycle made by this iconic company, you'll have plenty of options. Price varies significantly, depending on the condition, age, scarcity, and desirability of the model. For instance, a vintage Schwinn Breeze in need of restoration sells for as little as $70. On the other hand, a 1920s Schwinn Excelsior with the original paint can retail for as much as $900. Whether you're looking for a fixer-upper or want a bike in mint condition, there are plenty of places to shop. eBay is a great resource for all kinds of antique and vintage items, including Schwinn bikes. You'll see many of the models Schwinn produced in the last half of the 20th century, along with some older models from the earlier part of the company's history. You'll also find parts for Schwinn bikes of all ages. If you're buying a vintage Schwinn on eBay, be sure to ask lots of questions about the bike's condition. Also keep shipping costs in mind, since packaging and transporting a bike can be costly. Old Roads specializes in vintage bicycles from several different brands, including Schwinn. You can browse their selection online, and they also offer a great deal of helpful information about assessing a bike's condition. Before they are sold, all the bikes are tuned up by professional bicycle mechanics. Although the selection of merchandise is constantly changing, Craigslist can be a great place to score a deal on a vintage Schwinn. This isn't the place to go if you need a bike immediately, but if you're patient and watch the listings carefully, you may just find the vintage bike of your dreams. Although shopping online for a vintage Schwinn may net results, you may have better luck if you look at local shopping resources. Bicycle stores and repair shops often carry used or vintage bikes, and they may have some beautiful Schwinn models available. 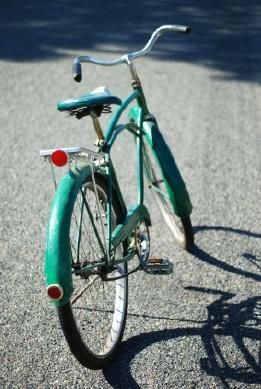 Additionally, you can find vintage Schwinn bikes at garage sales, estate sales, antique shops, and flea markets. Often, vintage bikes are not in great condition when you find them. In fact, this can be a great way to purchase an old Schwinn for an affordable price. If your vintage Schwinn needs some restoration, you can buy parts on eBay or from VintageSchwinn.com, a site devoted to Schwinn enthusiasts. Over the decades, the Schwinn Company manufactured dozens of bicycles in various styles. 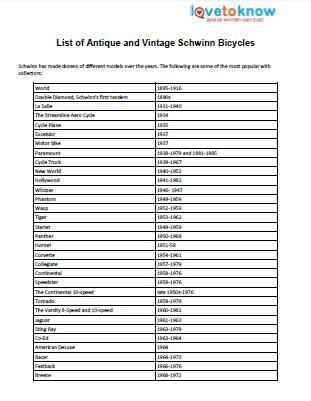 Click on the image to the right for a printable list of antique and vintage Schwinn bicycles. If you need help downloading the printable, check out these helpful tips. The following are highlights of two of the most popular of these vintage treasures. Do your research, both online and at local bike shops, to get the very best deal on vintage bikes or to restore your Schwinn to its original condition. Whether you dream of repairing your childhood Sting Ray, hanging your shiny red Phantom on your den wall, or amassing a large collection of vintage Schwinn bicycles, you are part of the love affair many people have with these beautiful, nostalgic, pedal-powered machines.